Visit New England for Art, fantastic Artist’s Studios and Galleries. From Fine Art in Stowe Vermont to Art Studios in Maine, New England offers one-of-a-kind shopping for art. Browse New England Art Gallery information and share your favorites. To feature your NE Art Studio Artists Gallery, contact us. Vermont is a great state to shop for art. Vermont has some of the nation’s most unique and diverse galleries and art centers. You can find Vermont artists studios, art galleries, art and cultural centers in every region of the Green Mountain state. Find more Vermont Galleries from VT LIVING.com. Visit NH for Art and you’ll find that New Hampshire Art Galleries, Studios and Curated Art Shows offer a wonderful opportunity. Find NH art and artist galleries, art studios and photography studios in every region of the state, but don’t bypass the lakeside town of Wolfeboro. New Hampshire Art Galleries, Art Studios and Photography Studios are simply amazing. 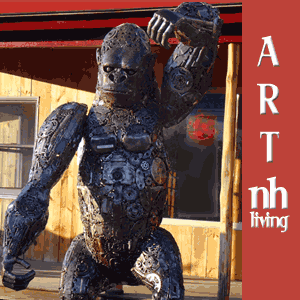 The New Hampshire Art Gallery Guide in NH Living will get to all of New Hampshire’s most popular attractions. Given Maine’s stunning coastline and beautiful landscape, it’s no surprise that the state has inspired many talented artists. No trip to Maine is complete without a visit to several of Maine’s exceptional Art Galleries. Maine galleries include Artist Studios where you can meet the artists – view and purchase their artwork. Maine galleries feature lighthouses, seashore birds, mountain lakes and more. The Maine Living Art Gallery Guide in ME Living will tell you more about unique Maine attractions and artist’s studios. Massachusetts Art Galleries feature all kinds of art: contemporary art, traditional fine art, glass art, prints, sculpture, fine art photography and other types of visual art. The Massachusetts Art Gallery Guide in MA Living will tell you more about Massachusetts Art Project, Artists Studios and selected Art Galleries. The Yale Art Gallery is a famous CT Art Attraction but there are many more surprises for viewing Art in Connecticut. The Connecticut Art Galley Guide in CT Living offers more ideas. A visit to the “Ocean State” of Rhode Island offers a variety of activities and attractions. Set your bookmark to Rhode Island Activities in RI Living for some suggestions.